As a rule, SPDIF converters don't offer similar sound quality, but it also depends on the computer or other device that you hook up to them. I don't know the UltraRendu but in general, the power supply for the device that you hook up to the SPDIF converter has a strong influence on the final result as does the power supply for the SPDIF converter itself. It's a can worms, unfortunately, and a lot of people will disagree with this, so trust your own ears. jfeldt and TarnishedEars like this. Yes they very in quality---a LOT. Berkeley Audio has one for a couple thousand...it's THAT important to do it right. I bought the relatively inexpensive Schiit Eitr and it compared well with raw SPDIF date coming off the same computer. Maybe a bit more extended in the upper registers in fact. Progress in tapping USB for audio and implementing a nice clean signal is an ongoing process. But it is virtually a must to have the best you can get. Because your signal can't be fixed once the quality is hosed. The better the front end is the better your whole system will respond. Schiit is supposed to be in the forefront of some of the progress happening on the USB convertor front. So far I'm impressed with my Schiit. I own three USB to SPDIF converters. Count me as part of the "a lot of people will disagree with this" camp in regards to these devices having a sound. Note the "best" one I have is this, which on Amazon for some reason requires you to buy the case separately. The magic trick that brand uses is an internal I2S bridge, just like a CD transport would use to connect to the DAC section of a CD player. I know we're in a hobby where some people like to attach a difference to every possible distinction, but I'm not sure why people decided USB to SPDIF was such a tough nut to crack that requires complex electronics and power supplies. What do you make of the fact that despite the fact this is an extraordinarily important device that can sell for thousands of dollars, you're having fantastic results with an entry level version? I currently use a Matrix Audio X-SPDIF 2 with my AN DAC 3.1x/ii Balanced. It does what I need it to do and it feels like a solid brick of aluminum in the hand. No complaints. Having said that, I did just order a USB/SPDIF converter from a fellow in Ukraine running under the name Abbas Audio on eBay. It has a tube clock and that intrigued me enough to at least give it a try for the sake of science/amusement. I’ll be traveling for the next couple of weeks, so unfortunately it will take me some time to report on the sound. That product sounds interesting but I'm confused, possibly from the lack of pictures on the output side of the device. 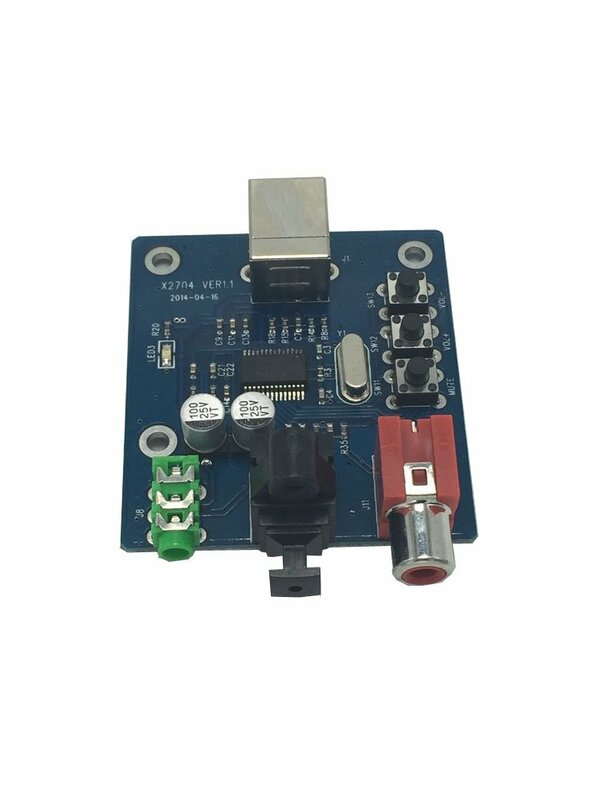 It looks like it only has a coaxial output rca output but the description mentions, "F-1 digital input interface using a standard USB2.0 interface, while F-1 has a wealth of output interfaces, including coaxial RCA and I2S interfaces." So what are they referring to? If I had to guess, the second time they reference the F-1 they actually mean the SU-1, its big brother. I believe some companies are dedicated to solving problems inexpensively like Schiit. On the other hand some companies are dedicated to designing circuits so musical they raise the bar on what is possible for sound quality. I would never put Berkeley down for charging a lot of money for some of the best sounding digital devices in the industry. Schiit on the other hand is a company that you just have to love for trying to be affordable AND cutting edge at the same time. Schiit reminds me of Hafler back in the early days of Dynaco, etc. The Texas instruments PCM2704 is a single chip USB-powered DAC with S/PDIF output. You can ignore the analog audio quality output specifications when evaluating a digital->digital out device with no conversion. It's not just the hardware you need to see if you like/dislike but also the software. And whether the software for that hardware will still be around and updated for whatever operating system you are using in the future. Otherwise you could be buying a future brick. I have the Schiit Eitr and can attest that it sounds VERY good; made my Schiit Gungnir D/S when using S/PDIF sound better than it ever had previously. Same for my Modi Uber. Also, Schiit provides a very good quality linear power supply for the Eitr, and the Eitr uses isolation transformers, not optocouplers, both on the input end and and the S/PDIF output end, resulting in excellent galvanic isolation. You won't find another product in its price class, or anywhere close, that uses isolation transformers. I think it does, actually. It's apples to oranges as that device is actually a Raspberry Pi hat, but from experience looking at similar products with and without isolation transformers, I believe that oblong silver object you see on that picture is a transformer. Note the Schiit Eitr has that same part, whatever it is. If you use the TOSLink output, optical isolation is better than transformers or ground lift or fancy regulation - remember, we aren't using the audio output on the USB/SPDIF interface (although you could compare it to the AN DAC if you wanted). Digital in -> digital out. I'm not sure why people decided USB to SPDIF was such a tough nut to crack that requires complex electronics and power supplies. I stayed away from USB DACs entirely for a long while due to reports that it was a bear extracting a noise-free low jitter SPDIF signal out of the USB mega-stream. When my last SPDIF Windows 7 native computer died I was forced to switch to modern USB implementation as Windows 10 computers don't seem to come with a native SPDIF output. All those years I waited---companies were working feverishly to improve the sound you get from taking USB and extracting audio data out of all the streams that are coming out of USB simultaneously. And they worked on lowering the artifacts and noise inherent with USB. I mean---USB even has a 5 Volt power charging lead inside the format. All kinds of noise there. Well, after I tried modern SPDIF cards and none of them would work any longer with Windows 10 the Schiit Eitr came up as the best sounding cheap way to get back to SPDIF. The Eitr is making some real clean music feeding my Benchmark DAC. And I still have the first version Benchmark. And now I get 24/192 no problem. And it sounds BETTER than using my previous SPDIF direct setup. At least the treble is clearer to my ears. And since treble is the one area that digital blurs and makes mushy it is nice to get a bump in quality for my efforts. Puma Cat and Encore like this. A friend of mine has it (w a tubed psu from Abbas too), and he likes it a lot. In fact, I heard it at his place but I’m not sufficiently familiar with his system that I could judge it. He also has a Dac from Abbas which is crazy good value for the money. I borrowed it and had it in my system for a week, and I was really impressed. This is the entire value proposition provided by Schiit, selling direct to customer, rather than the typical mfr->distributor->retailer->customer retail chain. It might be "entry level" with respect to price, but all that matters at the end of the day is performance. And the Eitr really delivers on that front. TimB Tube be or not Tube be? I use a Topping D10. Both a DAC and a USB converter. It runs around $70 or so. USB in, analog, optical and SPDIF out. It passes 24/192, I do not believe it can out put DSD. I use an audiophilio AP2 into a DAC 2.1x Signature. I haven't done comparisons to anything else. I am planning on doing the ultrarendu path at some point but an Io1 and step up will take priority first. schiit eitr has been compared to a lot of under 2k usb to spdif. its as good as anything basically short of REDNET stuff. Doctor Fine and Puma Cat like this.